James Freeman Clarke was a Unitarian minister, author, editor, and member of the Transcendental Club. Through reading Samuel Taylor Coleridge he became acquainted with Immanuel Kant and discovered that he �was born a transcendentalist.� He graduated from Harvard Divinity School in 1832 and immediately moved to Louisville, Kentucky to help establish liberal religion in the West. There he helped found the first Transcendentalist periodical, the Western Messenger, and served as its editor from April 1836 to April 1839. This magazine advocated the liberal tradition in religious thought, supported German literature, defended the views of Amos Bronson Alcott, and printed important Transcendentalist texts�including the first poetry published by Ralph Waldo Emerson. 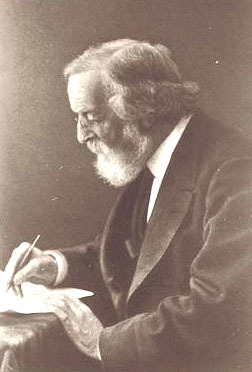 Clarke closely studied German works, especially those of Johann Wolfgang von Goethe, and translated Wilhelm Martin Leberecht de Wette for George Ripley�s Specimens of Foreign Standard Literature in 1842. With his sister Sarah Ann Clarke and Margaret Fuller, he participated in Fuller�s famous trip to the Great Lakes in 1843.